Look, Ma! I wrote a book!! Not me, that’s for sure. I don’t think there’s anyone more surprised to have a book published than I am. I’m still having a hard time believing it myself. 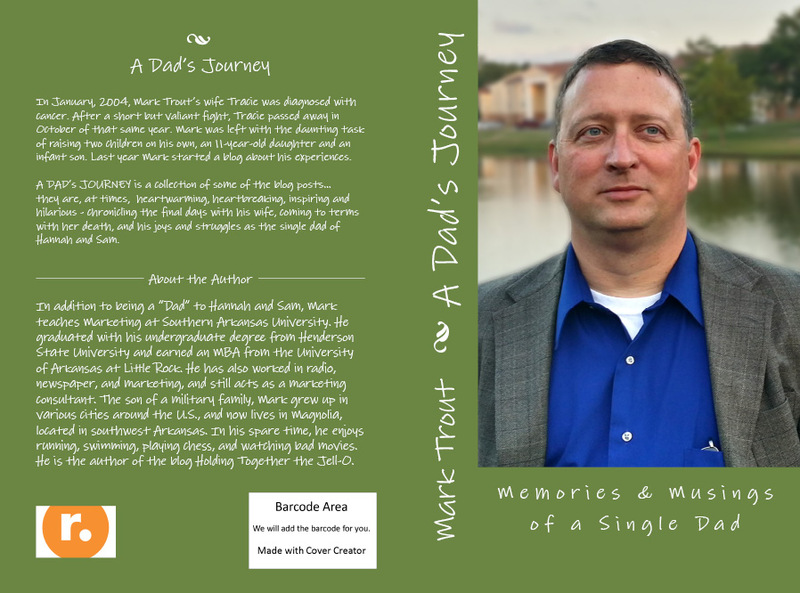 I recently published my first book, A Dad’s Journey, with Raburn Publishing. It is a collection of many of my blog posts that tells the story of my time as a single father. When I started the blog a little over a year ago, I was hoping it was something that might inspire and encourage those (dads and moms alike) who found themselves in a similar situation. And I hoped to have some fun with it. If you’ve read my blog, you know we’re not exactly the most normalest of families. And I thought sharing some of the things we’ve been through and some of our daily adventures might be fun and funny. But even through all of that, I never actually imagined that it would lead to a book. But it has. And for that, I say . . . Thank You. This would not have happened without the support and encouragement from my readers. So thank you for turning last Thursday, May 29, into one of the most memorable days of my life. If you would be interested in purchasing a copy, you can order directly from the publisher at http://www.raburnpublishing.com or you can order from Amazon. Again, thank you. Thank you for reading. Thank you for encouraging me. I look forward to continuing the sharing of life and laughs in the blog. Sorry. I thought I had that right. I’ll fix it. Believe it or not, I really CAN see you writing a book! I knew you had it in you. Congratulations! I do enjoy your blog posts. You are one of the very few I follow. I feel like I am staying in touch with you (I particularly enjoyed the recent one about the demise of ‘Preacher’ the dog…especially since I know your Mom!). By the way, Sharon gave me a new tennis racquet for my birthday…a real titanium-graphite composite…the first since my old wooden Spalding ‘Pancho Gonzales’ from 1969 (which I still have, BTW). It’s been almost that long since I played, but I’ve got a man in the church who is wanting me to start hitting with him. He’s a beginner, so maybe I’ll have a chance! Or, maybe not! Have a great day. Thank you, Brother Greg. I appreciate your kind words and confidence in me. I need to have that same confidence in myself! And thank you, that’s one of my favorite stories as well. Your racquet sounds really nice. I’ve played a few times over the last couple of years. We may have to get together and play. But I’m not sure I would be much of a match for you. Oh my gosh! Congrats on this! You are living my dream right now!